"... Topsider homes... weathered Hurricanes Katrina and Rita.... a Topsider home remained standing when others in the area did not..."
"... wind got up to around 90 miles per hour ..the tides were high, but we were fine. Some homes not terribly far away simply disappeared...."
"....I was amazed..not one pane of glass broke. From inside the house, you wouldn't even know there had been a hurricane...."
"After my home was destroyed by a hurricane, I said I would never build another home at the beachfront unless it was hurricane proof. A friend told me about Topsider Homes, and after doing the research, I decided it was the perfect fit. My Topsider has been through numerous major storms and hurricanes, and each time has come through in one piece." Hurricane and storm resistant homes built to last since 1968. Post and beam, panelized components allow for speedy home assembly. 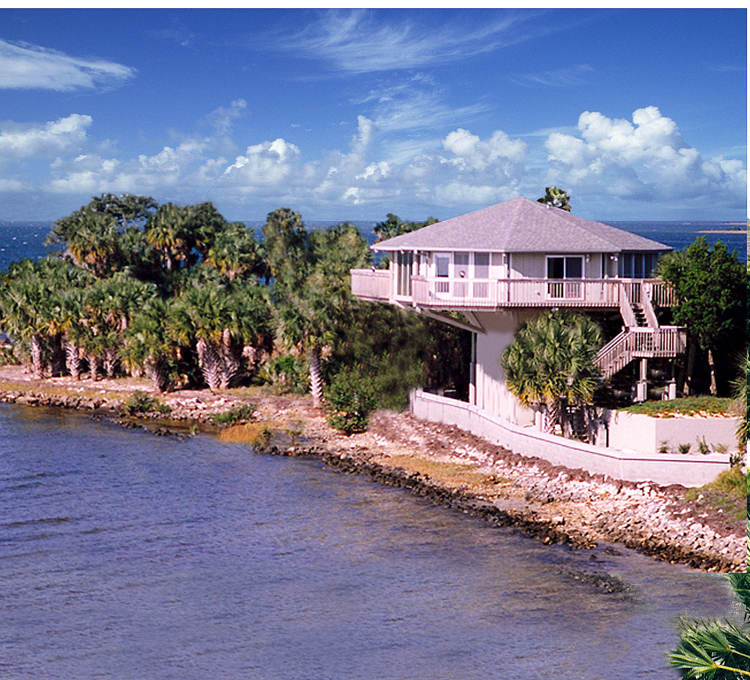 Topsider Homes have withstood many of the most devastating hurricanes, including direct hits from hurricanes Irma in the Virgin Islands and Florida Keys, Andrew in the Bahamas and Florida, Hugo, Ivan, Katrina and Rita along the Gulf Coast. 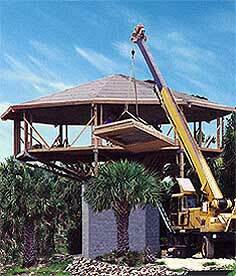 Each Topsider Home is custom designed and engineered to withstand high winds and to meet or exceed building codes in all coastal and hurricane-prone areas. And while no home is totally hurricane proof or storm proof, Topsider's record of storm safety and survival over the decades is extremely impressive. 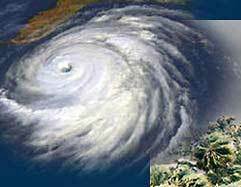 to high winds and storm surge. Topsider Homes' storm and hurricane resistant features are the result of a unique blend of modern engineering and state-of-the-art building technology, combined with a time-proven post & beam building system. 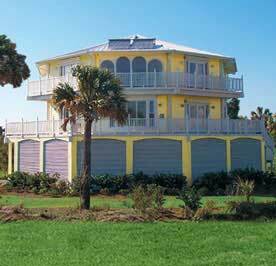 This combination creates houses that are structural battleships, resistant to tropical storms, hurricane force winds and storm surge. 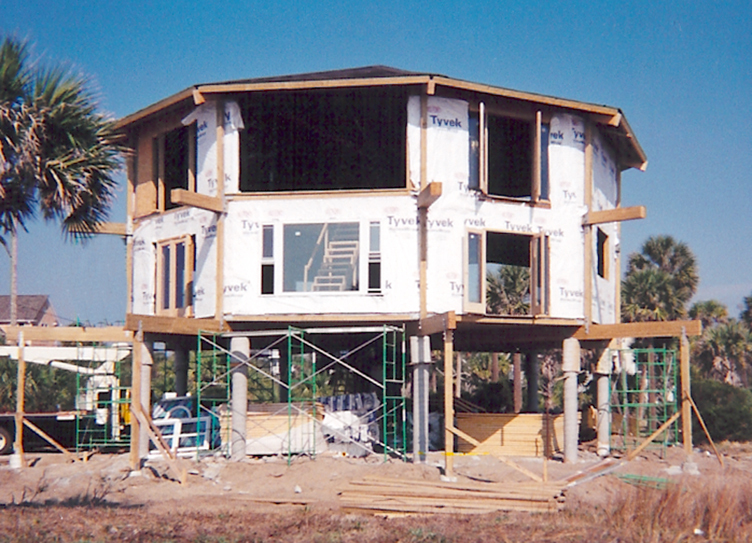 And because our pedestal, stilt and piling homes for beachfront and coastal areas are both elevated and multi-sided in design, storm and hurricane winds flow around, over and under them with far less damage-causing wind resistance than with conventional designed houses. 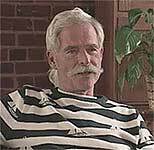 "After Hugo came through, there were some houses with no roofs and windows gone. Some wood houses were just not even there. My Topsider Home looked like there hadn't even been a hurricane. The house was practically untouched." 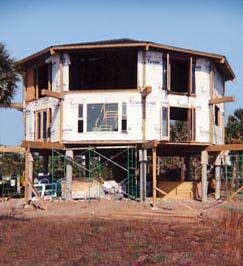 Beachfront and coastal area houses custom designed and engineered to meet government requirements. Panels attach to laminated timber components, built in erector-set style and held in place by galvanized steel coupling. 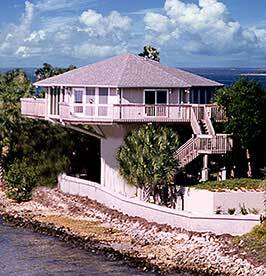 Two-story luxury stilt home design built oceanfront with ground level breakaway walls. 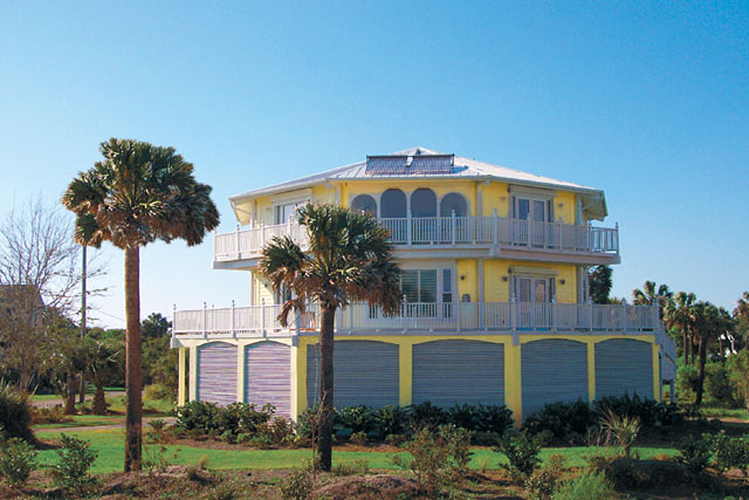 Topsider's in-house design group and consulting engineers have been designing and specifying beachfront and coastal area homes for years, and are knowledgeable of ever-changing building code requirements from Florida to Hawaii. They are also highly experienced in working with local building officials and various agencies, including coastal commissions, FEMA, the US Army Corp of Engineers, Coastal Area Management Act (CAMA) authorities, and various state agencies, such as Florida's Department of Environmental Protection (FDEP). Proper specifications are the key to building a beachfront or coastal home that is potentially storm proof and hurricane proof. 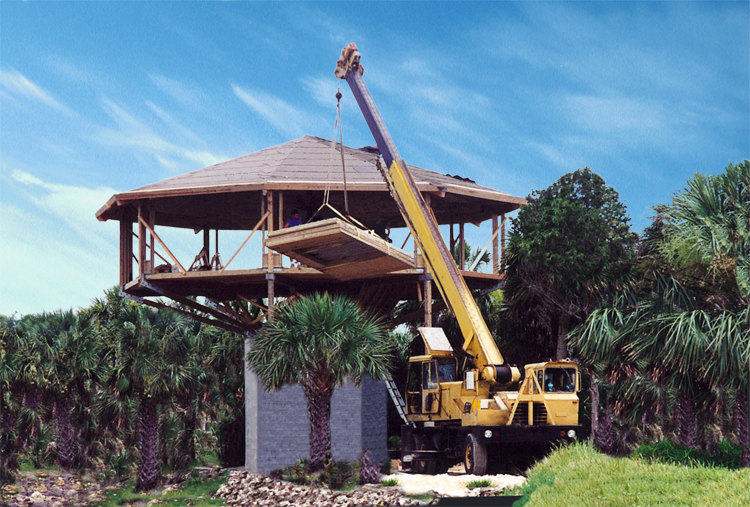 Learn more about Topsider's approach, its specifications and expertise in custom designing unique pedestal, piling and stilt houses resistant to the effects of severe weather conditions, and the degenerative effects of a tropical climate and salt-air coastal environment.